A significant jump in performance for the $150 gaming crowd. (+) Maxwell: Affordable; 1080p gaming ready; energy efficient; quiet. (-) Farewell: Still needs 6-pin power; not much cheaper than GTX 960. If there’s one thing we love more than fast GPUs, it’s affordable and fast GPUs. The best-selling graphics cards of all time have generally come from the $150–$200 sweet spot, and for those users looking to balance price and performance, skipping a couple of generations between upgrades is generally the way to go. You’ll miss out on some features and performance, but even moderate hardware from a few years back can still run most games at 1080p with settings that look decent. Nvidia is attempting to go after these infrequent, mainstream upgraders with its latest Maxwell 2.0 graphics card, the GTX 950. With graphics cards having stalled at 28nm for so long, we’re now into our third-generation 28nm parts. Nvidia has worked around the problem by focusing on efficiency, spearheaded by its Maxwell architecture. Its first Maxwell GPU was the GTX 750 Ti, which offered extremely impressive performance in a 60W part. From there, we jumped to the Maxwell 2.0 parts, but these have so far targeted enthusiasts, with the least expensive part being the $200 GTX 960 (which you can now find starting at $185). The 960 is a great card for 1080p gaming, but what if you’re willing to settle for lower performance if it means saving some cash? Enter the GTX 950. The $150 price point has been ruled by the GTX 750 Ti since its launch, but even though it’s around 75 percent faster than GTX 650, plenty of people held off upgrading. According to the July 2015 Steam hardware survey, the GTX 650 is still the fifth most popular dedicated GPU, just ahead of the GTX 750 Ti. The most popular discrete GPU right now is the GTX 970, but with prices starting at $310, it remains out of reach for many. A large cooler for a relatively low power GPU means EVGA's GTX 950 will stay quiet and overclock well, and it comes with a healthy factory overclock to get you started. EVGA also includes an 8-pin power connector, which is likely overkill even with overclocking, but it allows the card to potentially use more than 150W. Similarly well-cooled and quiet running, the Strix 950 from ASUS comes factory overclocked and even has a 0dB mode where the fans won't spin up until the GPU hits 65C. Once upon a time, the GTX 650 was the king of $150 graphics cards. Three years later, it's really struggling to provide a decent gaming experience at 1080p on modern titles. For $40 more, you can get a good quality GTX 960, so the job of the GTX 950 is to prove that you can save your pennies and stick with the little brother. So, what can you expect from the GTX 950? Nvidia is claiming up to 3X the performance of GTX 650, with 2X the performance per watt. We ran our own tests, and while we don’t expect many would consider pairing the GTX 950—even in SLI form—with an i7-5930K, we’ve done just that in order to keep our test system consistent. Here’s how things shake down, with the GTX 960, 950, and 650. (No GTX 750 Ti was on hand, but we’re still looking and will update the charts if we can scrounge one up.) We tested at 1080p, with High as well as our Ultra settings that we’ve used in recent high-end GPU reviews. We’ve come a long way since the GTX 650 launched in September 2012, to the point where it’s unable to handle running most games at 1080p with high quality settings—medium should be playable, but certain titles really struggle. The GTX 950, meanwhile, comes pretty close to delivering on Nvidia’s 3X the performance target: we measured a 140–245 percent performance improvement over GTX 650, with a 170 percent average improvement. Nice! And just to drive the point home, here’s what happens if you try to run ultra quality, with 4xMSAA in several of the titles. The improvements over GTX 650 are even higher this time, averaging nearly a 200 percent improvement. Or put another way, the GTX 650 only breaks 30fps in one of the seven games we tested, while the GTX 950 only fails to break 30fps in one of the seven titles. Our 97 percentile frame rates back this up as well, with a few memory requirements proving to be far too great for a 1GB graphics card. Nvidia has also been working on GeForce Experience, and one of the new features is low-latency optimizations for MOBA games like LoL, Dota 2, and Heroes of the Storm. For competitive gamers looking for every possible advantage, Nvidia used a high-speed camera to show that its low-latency optimizations were able to reduce the latency from 80ms on a GTX 650 to 45ms on a GTX 950—even with the GTX 950 running higher-quality settings. The tweaks could be done without GFE, but it’s becoming a one-stop center for tweaking graphics settings on Nvidia hardware. Another feature Nvidia demoed—but something that we won’t be seeing until the September time frame—is called GameStream. Using some of the same technology that goes into ShadowPlay and Twitch streaming, Nvidia has created a new feature that could just about sound the death knell for discrete graphics cards in laptops. GameStream will allow you to remotely connect to another person’s PC (including your own desktop) to watch another person play. No big deal so far; it’s just something like a private video stream from a friend. Kicking it up a notch, however, GameStream will allow you to grant the remote viewer control of the game, so for example, if you were stuck, they could show you how to advance further in the game. (Nvidia used Trine 3 as a demo of GameStream.) The remote controls were very low latency, and while there was a loss in quality due to the 720p video stream, it was still acceptable. But that wasn’t the end of the demo. As a final coup de grace, GameStream also allowed co-op play with the remote player. This is the point where we broke the demo by trapping the other player behind a grate—sorry, Nvidia! GameStream isn’t quite ready for public release, but assuming it works with any and all full-screen games, which is what Nvidia seemed to indicate would happen, this could be a killer app. All you need is a Chrome browser plugin on the receiving end and a GTX GPU on the source system, and you should be able to play games on any relatively modern Windows system. Got an Ultrabook with a weak HD 4000 GPU? No problem! Think of it like the streaming for SHIELD devices, except now SHIELD isn’t required. We’re definitely excited to test out GameStream more and see how it works with a variety of systems, as well as what sort of Internet connection will be required. Getting back to features and reasons to upgrade, Maxwell 2.0 has some useful additions, probably the most beneficial being MFAA—Multi-Frame Anti-Aliasing. Using some special sauce, MFAA is able to provide 4xMSAA quality with the performance hit of 2xMSAA. Depending on the game, the benefit is a 10–30 percent increase in frame rates. The catch is that MFAA is still more demanding than no AA at all, and with hardware like the GTX 950, there are going to be cases where you’ll want to disable all AA in order to improve performance. Interestingly, the arrival of GTX 950 does not mark the end of the GTX 750 Ti, thanks to the higher TDP. With online prices now hovering around $120, the 750 Ti remains as Nvidia’s fastest sub-75W GPU for those that don’t have a 6-pin PEG connection or a PSU capable of handling higher-performance devices. The GTX 950 also looks to be slightly faster than AMD’s competing offering, the similarly priced R9 370, and it has a 20W lower TDP, but we’ll have to wait to run some additional tests. If there’s one problem with the GTX 950, it’s the target launch price of $159 and the close proximity to faster GPUs. In theory, the GTX 960 is a $199 part, but while plenty of 960 cards fall into the $200-and-up range, there are also 960 cards priced as low as $185. 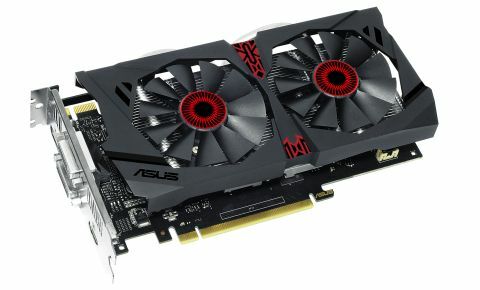 We have both Asus and EVGA GTX 950 cards that come factory overclocked, and pricing is likely to be $10–$20 higher than the base model GTX 950 cards… which puts them within $5 of the least-expensive GTX 960. The GTX 960 tends to be around 15 percent faster than GTX 950, and given that most GM206 GPUs are capable of a decent amount of overclocking, most of that margin should remain. Which means you’ll have to decide between paying a bit more for bigger gains in performance, or you can save your pennies. Either way, until we finally start seeing 16nm FinFET GPUs next year, GTX 950 is likely to hold the $150 gaming crown. And if you’re still hanging onto a GTX 650, we feel for you; give yourself a treat and upgrade to a faster card as soon as you can. As a final thought, the GTX 950 is basically greater than or equal to the PlayStation 4 GPU in terms of graphics performance. So if you have any moderate PC and you’re debating between buying a console and a “gaming PC,” just grab a GTX 950. You can thank us later.